Looking for crowd-pleasing appetizer recipe? 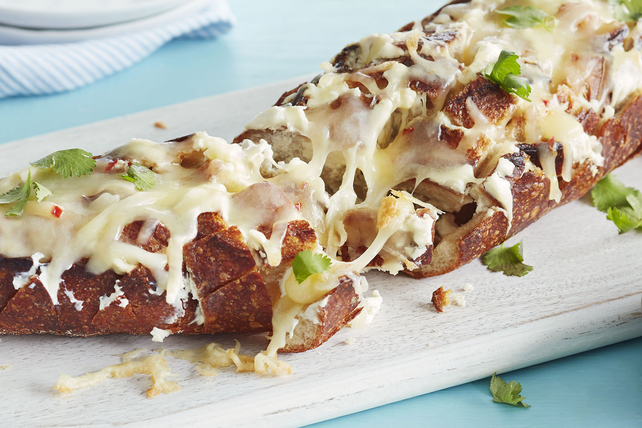 Our easy-to-make Cheesy Fiesta Pull-Apart Bread is sure to win rave reviews. Use serrated knife to make diagonal cuts, 1 inch apart, into top of baguette, being careful to not cut all the way through to bottom of baguette. Repeat to make additional cuts, at 90° angles to first cuts, to resemble crosshatch design as shown in photo. Spread cream cheese product between cut bread pieces; sprinkle evenly with shredded cheese. Wrap in heavy-duty foil. Bake 18 to 20 min. or until heated through. Unwrap baguette; sprinkle with cilantro. Let everyone serve themselves by pulling off their own bread pieces at the table. You can instead use your outdoor barbecue to grill our Cheesy Fiesta Pull-Apart Bread. Heat barbecue to medium-high heat. Prepare and wrap baguette as directed. Grill 15 min. or until baguette is heated through. Unwrap baguette, then sprinkle with cilantro as directed. If you don't have heavy-duty foil, you can instead wrap the baguette in a double layer of regular foil.